Contact us for Thermal Validation and Qualification services and Save Money, GUARANTEED! Temperature validation or thermal validation is the process of validating a process or an asset. An asset is validated to ensure that the asset is capable of storing or transporting the goods at the desired temperature. 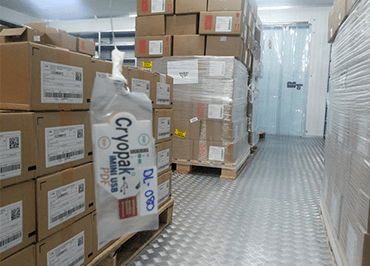 Thermal validation of Cold rooms and walk-in freezers. Thermal validation of vans and reefer trucks. Thermal validation of passive and active cooling boxes. The validation tests involves all processes covered under qualification and mapping study for each of those assets. The terms validation and qualification are often used interchangeably as well. However validation is more important for processes. As an example consider that you want to validate the entire process from storing to the distribution of medicines. In this case you have to analyze the entire process from packing to loading to the vans, delivering to the pharmacy etc. Such an analysis is done to ensure that the entire process doesn’t compromise quality of the medicines. After such validation process, the sequence can be included in the SOP (Standard operating procedure) as well. Receiving the goods at the airport and transporting to your warehouse. Unloading process and stacking process in your warehouse. Storage for couple of weeks or months as per your normal cycles. Loading to smaller vehicles for local distribution. Transporting to distributors, hospitals, pharmacies etc. The whole process will be tested in the process of thermal validation to check that the temperature is maintained throughout the complete process. Once thermal validation is completed, you can incorporate the findings in your SOP (Standard operating Protocol). This protocol will be the guidelines for your complete operation team. Thermal validation includes temperature mapping of the assets as sell as verification of the processes. 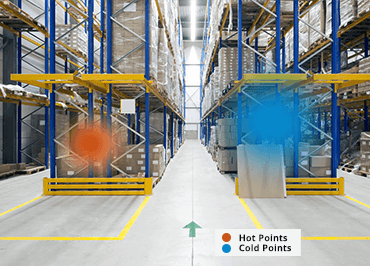 Temperature mapping study also known as T-mapping is carried out for various assets used for transportation and storage of temperature sensitive products such as medicines, vaccines, body cells and tissues, food items etc. What is temperature mapping study? This study is analysis of a closed environment which is maintained under controlled temperature conditions using cooling or heating equipment. The idea is to find out that the temperature is uniformly distributed inside the environment as per the specified requirements. How is temperature mapping study carried out? The basic idea is to collect temperature data continuously over a period of time to analyse and find out the results. In order to do this, temperature data loggers are required to record the data. The data loggers are placed around the entire area in a systematic pattern to record the data over a specified period under various operational conditions. After the specified time, the data is downloaded and analysed. The analysis is carried out under different climatic conditions to analyze the behaviour in different climatic conditions. Which are the assets requiring temperature mapping study? Normally a mapping study study and analysis is carried out for Vans, Vehicles, Reefers, Cold Rooms, Fridge,Freezer, Ware houses, Boxes etc. which are used for transportation and storage of medicines, vaccines, blood, tissues etc. Also this study is carried out for controlled hot conditions such as an autoclave, furnace etc. to ensure uniformity of the temperature. Temperature qualification study is a detailed process involving lot of tests and analysis to ensure that the asset is designed and installed properly and is capable of maintaining the desired temperature and humidity. After this elaborate process, the asset is certified as qualified for achieving and maintaining the desired levels of temperature and humidity. Installation qualification is the process of verifying that all major components of the assets are installed and maintained as per the design and as per the recommendations of the manufacturers of the respective items. Also relevant local guidelines need to be verified. Installation qualification is generally known as IQ. Operation qualification is verifying methods of operation of the entire assets and its major components. All these should be operated as per the manufacturer’s guidelines and SOPs implemented by the user. Operation qualification is generally known as OQ. All documents such as calibration certificates, maintenance check lists, operation check lists etc. have to be maintained as per the written procedures which are verified in this stage. 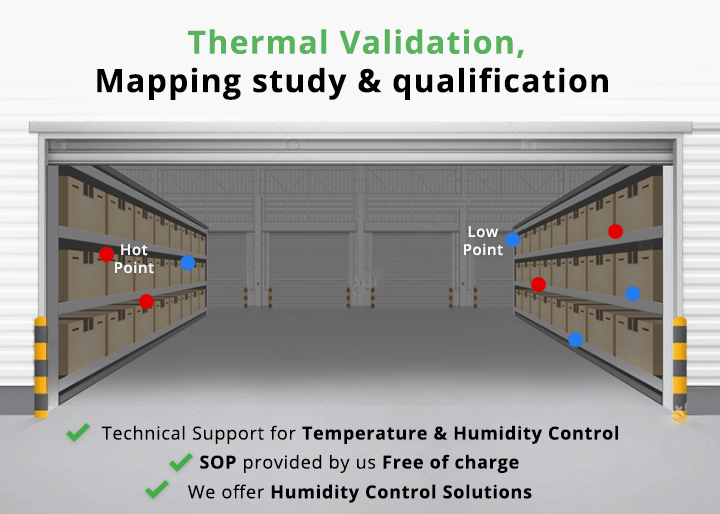 Video: Why a Warehouse needs Temperature Mapping Study? These customers are for our various products and services.